VietNamNet Bridge – Domestic waste management and treatment has been a pressing issue for rural areas in Viet Nam for many years. In suburban Chuong My District in Ha Noi, tonnes of waste have been discarded on the sides of roads, forming huge mounds of stinking rubbish, Thanh Nien (Young People) newspaper reported. “Plastic bags full of rotting trash pile up and spread onto the road, but it is rarely taken away,” said Le Thi Hien, owner of a beauty boutique near a dump in Ngoc Hoa Commune. Residents of Sai Son Commune are struggling to cope with untreated domestic waste. Many have installed glass and net doors to keep out flies and smells – and most have installed insect traps and burn incense, said resident Phung Thi Khanh. Untreated domestic waste is also polluting agricultural land, ponds and rivers in the northern province of Vinh Phuc, and robbing local farmers of their livelihoods. Pham Thi Sinh, a resident of the Doai Village, said she had to stop growing vegetable and peanuts a few years ago because her field was polluted by waste from an adjacent landfill. 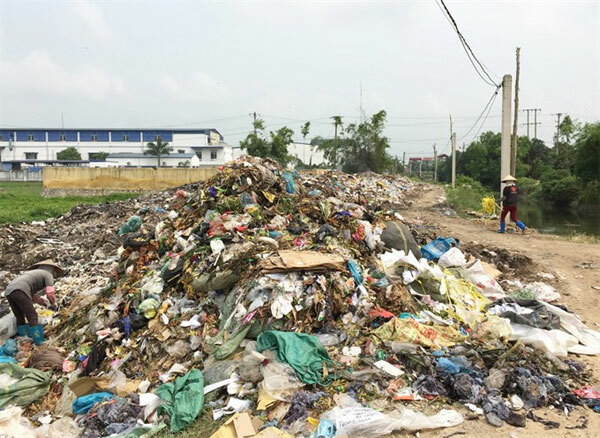 It is beyond the capability of authorities to treat all domestic waste, said Trinh Duy Hoa, vice chairman of the People’s Committee of Ngoc Hoa Commune in Ha Noi. Pham Manh Cuong, deputy manager of the environmental protection division of Vinh Phuc Province, said that the province was only able to treat 400 out of 585 tonnes of domestic waste every day, either by burning or burying. Sometimes resident burn waste themselves, which creates air pollution, said Nguyen Van Thang, vice chairman of the People’s Committee of Chan Hung Commune in Vinh Phuc Province. A 2014 report on dioxin contamination in the Vietnamese environment issued by the Ministry of Environment and Natural Resources shows that several samples of emission fumes and waste taken from incinerators in Hà Nội, HCM City and the northern province of Hai Duong have dioxin concentrations and dioxin-like toxicities many times higher than the permitted levels. Nguyen Thanh Yen, deputy director of the department, told Thanh Nien that rural domestic waste could not be eradicated because of the overlapping management by different authorities. To improve waste treatment in rural areas, Yen said that the environment ministry would collaborate with other management agencies and local authorities to develop a solid waste treatment mechanism which reduces the amount of buried waste and promotes waste recycling, waste re-use, and energy recovery from waste. The ministry will review rural environmental protection policies, and redefine the roles of each management agency, enterprise and community in waste management, he said.